← Prohibition Lifesavers: When Butter-Rum was Butter-Yum! 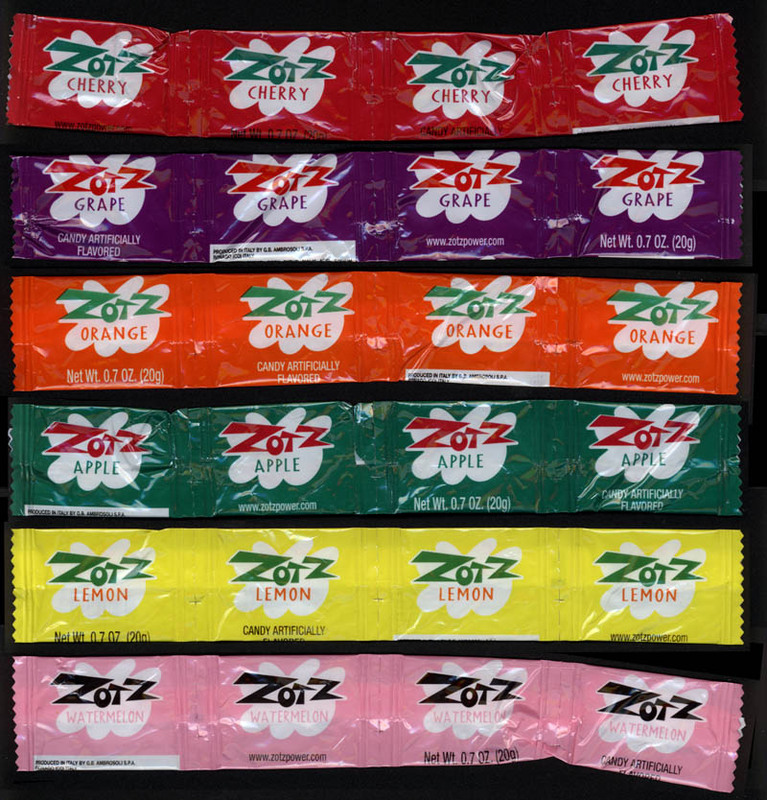 I have clear memories of Zotz candy from when I was a kid, both the packaging and the confectionery experience it contained. 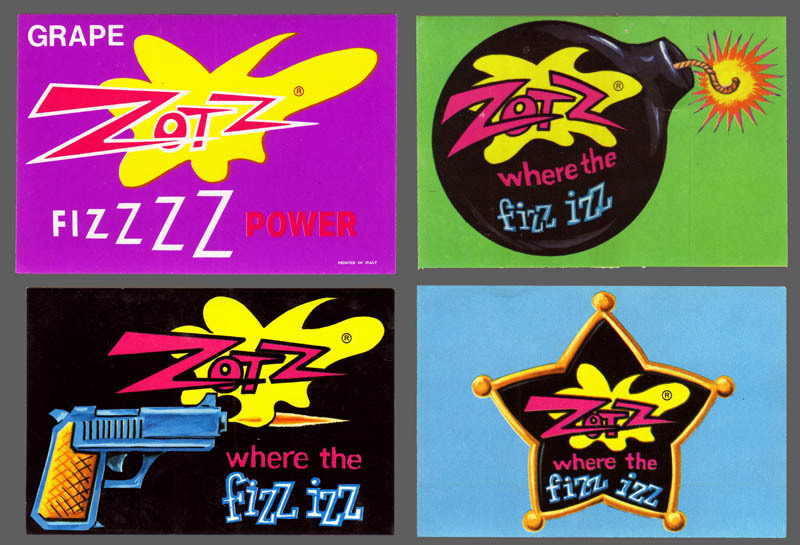 The Zotz name and logo was like a comic book sound effect, and it accurately described the exclamation of eating one. 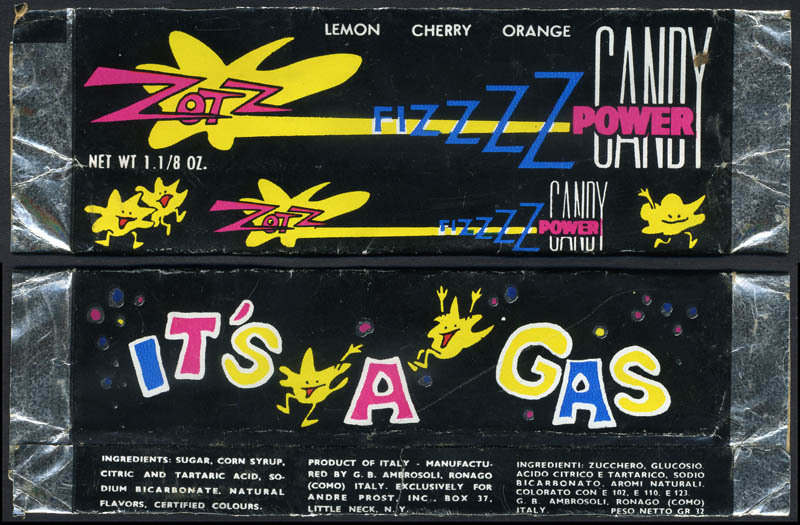 Years before Pop Rocks would arrive on the scene, Zotz was the first candy that made me suspect that some strange science was at work inside. 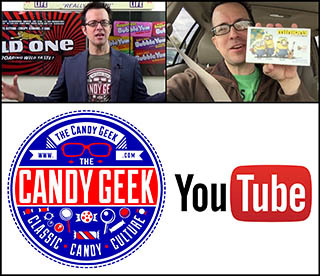 You see, this sour candy actually created a kind of fizzing when you ate it. 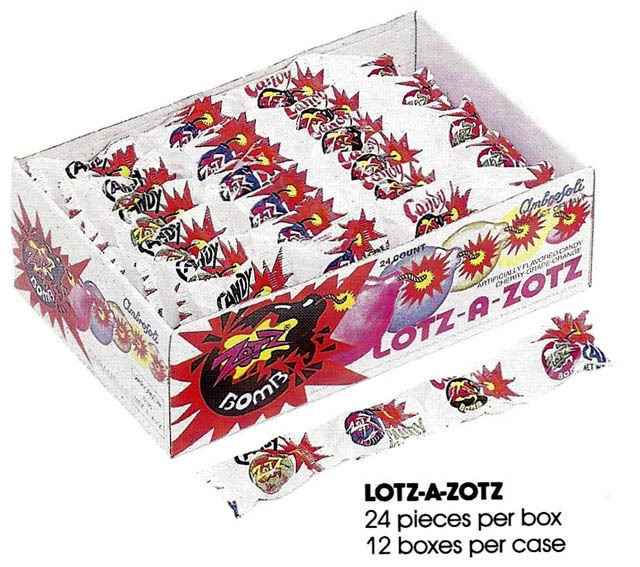 Tracking down vintage Zotz packaging pieces has proven to be especially challenging, likely due to the fact that it’s tough to get to the candy inside without tearing up the wrapper along the way. So, I don’t have any more vintage pieces in my own collection. 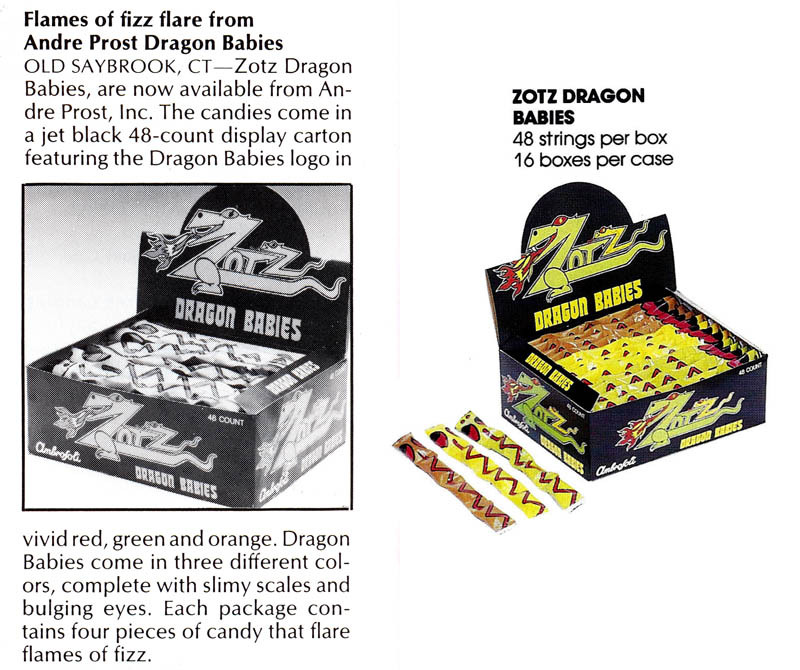 Zotz - Dragon Babies news clipping. 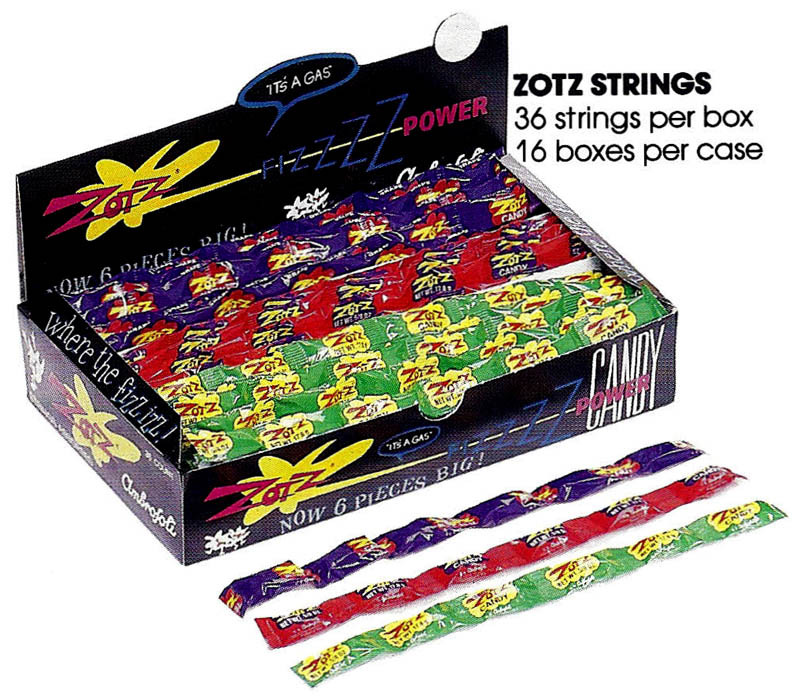 Color image courtesy Andre Prost Inc.
Zotz Pops - 1987 - Courtesy Andre Prost Inc.
Zotz Power Pack - 1987 - Courtesy Andre Prost Inc.
Lotz-A-Zotz - 1987 - Courtesy Andre Prost Inc.
Zotz Strings - 1987 - Courtesy Andre Prost Inc. This entry was posted in 1970's, 1980's, Hard Candy and tagged 1970's, 1980's, 70's, 80's, candy, collecting, confection, fizzy, history, nostalgia, nostalgic, packaging, Pop Rocks, retro, sweets, vintrage collectible, wrappers, Zotz. Bookmark the permalink. 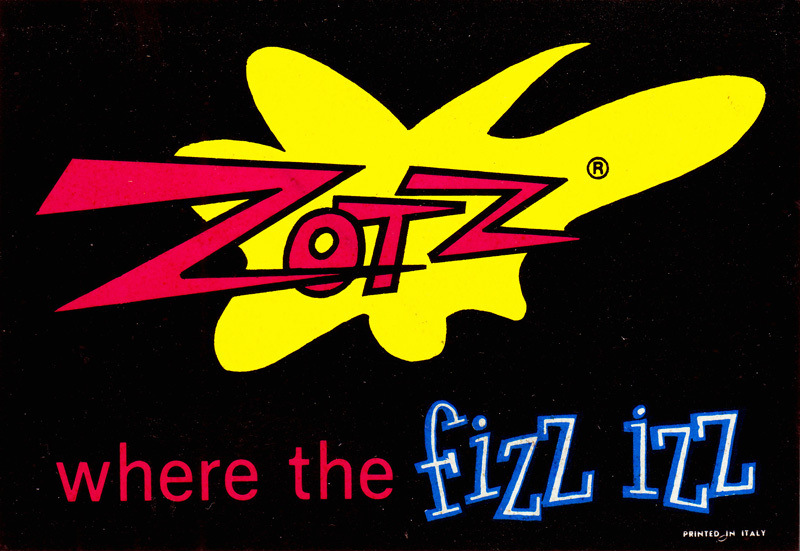 5 Responses to Zotz – Where the fizz still is. These are probably my favorite candy; I’ve got a couple of strings of ’em here at my desk as I type. 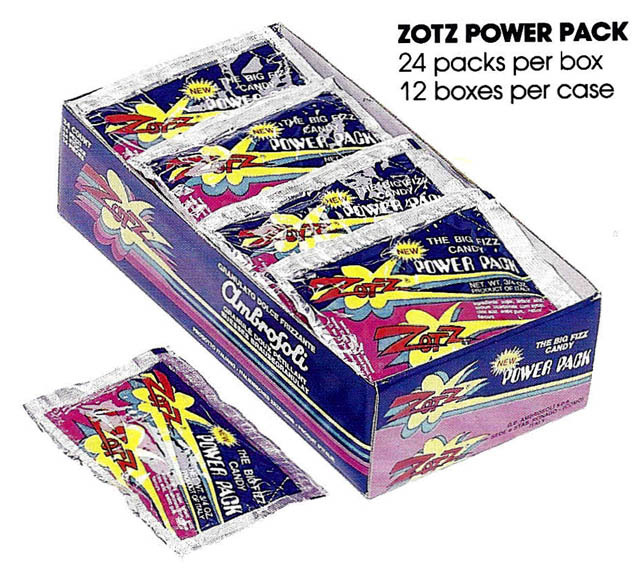 If I’m remembering right, the Zotz Power Packs were great; they were just the fizzy part, without the candy shell, right? They were shaped like chow mein noodles, delightful little fizzy worms of goodness. I wish they still made ’em, though it kind of gives me a stomachache to contemplate! Ha! I sold this candy in middle school around 1970 for a couple of years. Very popular and my markup was huge! Then I got to high school and switched to pot. Made even more! I do believe that in the last few months ZotZ candy has been changed to a bigger size with more fizzy goodness in the middle! 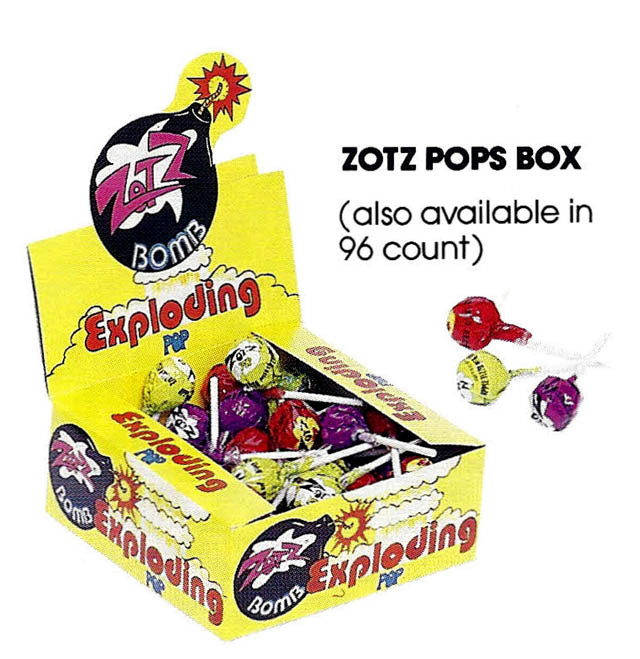 When I was young growing up in Adrian, Michigan, I’d beg my parents to buy the ZotZ Exploding Pops every time we went to Arbor Drugs(Now CVS Pharmacy). I’m now almost thirty and live in Ohio. I was recently surprised to find these at the Fudge Haus in front of Scmidt’s Sausage Haus in Columbus, Ohio. I picked up one of each flavor along with some other classics from the nice selection they had there. They even had homemade candy. Yum! 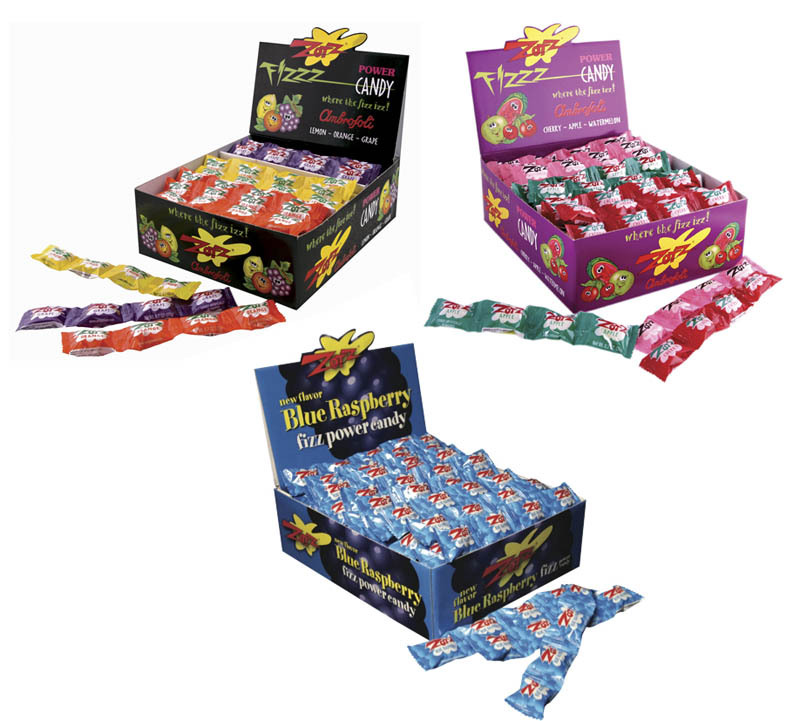 As I was sitting here enjoying an Orange ZotZ, I decided to search the web for info on ZotZs and found this page. Ahh Nostalgia at it’s finest. I enjoyed the article, thank you! Also, If you’ve never been to the restaurant Schmidt’s and enjoy German food/Atmosphere or sausage, please, do yourself a favor and go! I loved these candies as a kid! I was just thinking of these I the past year and looked them up and seen them on the Internet. I was telling a lady I worked with about them just a week ago and my wife came home with some 2 days ago. A local store is carrying them. They are $1.00 for a strip of four. That’s cheaper than anywhere on the net. I went and bought more today in cherry, Apple and watermelon. I still would like to have some grape ones I ate as a kid though!